Last week I shared my new living room arrangement. It’s been growing on me as the days have gone by. I think it might be a keeper. The big problem I’m having is with the space to the left of the tv. It’s empty wall space that is calling for something to warm up the room. 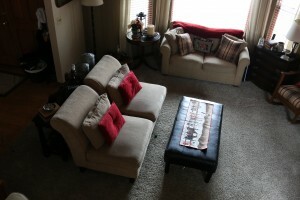 This room is usually colder than the rest of the house and the couches are not that comfy. It needs something cozy and inviting. 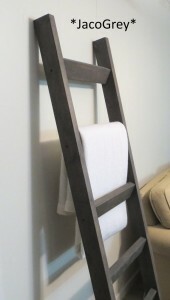 I ordered this blanket ladder from an Etsy shop called JustKnotWood so that I can lean it against the wall in that corner. My friend bought one and I love the way it looks in her room. You can choose your own stain color, so I choose a dark brown. I can’t wait for it to arrive! Now, I need a thick-knit cream blanket to hang on it. I thought about quilts because I have so many of those, but the room is already busy with patterns. I think the cream blanket will add texture without overwhelming the space. 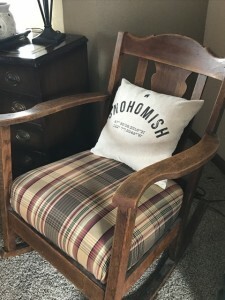 I also found the perfect pillow cover for the pillow that sits on the rocking chair. This is from an Etsy shop called SoVintageChic. She’s a local gal, so I just had to support her! 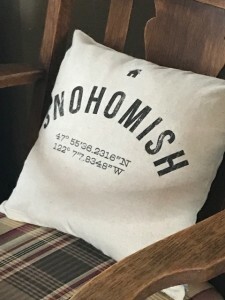 I’m in LOVE with this pillow! It has our home town and the longitude and latitude coordinates. I bought the 16″ pillow cover. Hindsight, I wish I would have gone bigger, but it still looks great and feels personalized for our family. I love everything about home and family, so this feels special. 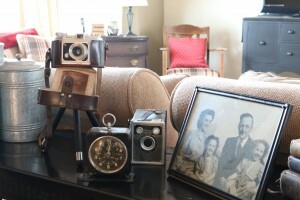 I also love that it’s sitting on my great-grandmother’s rocking chair. 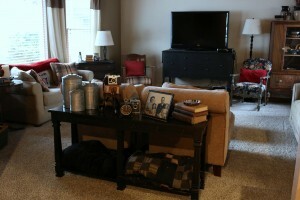 So, that’s the style update for the living room. Now, I’m just waiting for my blanket ladder to arrive!